I heard that a new cellar door was on it’s way. I heard it was for a local identity family – Vasarelli. I got a message on Facebook that a new restaurant had opened just before Xmas day called, you guessed it Vasarelli’s. Well I had to find out about this myself. By my reconing this was the 62nd normally opened cellar door (ie not a by appointment only cellar door) in McLaren Vale – I have been to 59 cellar doors in the last 2.5 years so I though I had better get to number 60. I must say it is great to see a local business deciding to take their accountant buy the b_lls and expend at this time in the wine industry cycle – I take my hat off to them. It is also great as this facility is within walking distance from my front door. 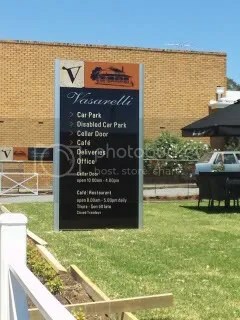 The first thing I can confirm is that Vasarelli’s is a Cellar Door and Restaurant combined. Secondly, I can confirm that they have done a great job at renovating the building (see the outside below). 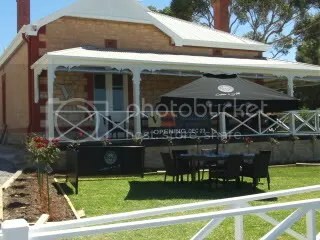 They are at 169 Main Road, McLaren Vale (phone: 8323 7980) and note they do not have a web site at the time of writing. The tastings are held at a dedicated bench area found just inside the access door. The interior is well done and it certainly has a new feel to it – very welcoming. Anyway, what about the wines. The nose shows melon characters from the chardonnay and these continue on the palate with an addition of berries from the Pinot Noir. The overall wine is light and refreshing with lots of simple fruit flavors. While I was doing this tasting a group came in and one of the ladies tried this and made a loud “oohh” sound of delight – a strong indication she liked the wine. This would be a good party / friend wine – or as I would say, one to have on a Sunday afternoon with friends. I would not really consider this a food wine though in keeping with the party theme then finger food would go well with this one! The nose on this one was closed – I let it warm up for a while in the glass with no improvement in aromas. The palate was full of yeasty bread characters from yeast contact with melons hitting you on the back palate. A more complex wine than the Cuvee above and it would go well as an aperitif at the start of most meals – particularly during the festive season (noting that this tasting was done between Christmas and New Years Eve). Again the nose was closed, even after some hand warming of the glass. The palate had lots of the melon with just a hint of peach. An unwooded fruit driven style, which though not to my taste, is well made and would suit the summer restaurant market (Vasarelli’s suggest this with their Mushroon Risotto). The wine was aromatically challenged – I could sense some complexity but not really sure what it was. The palate was full of melons, peaches and cream (I suspect the creaminess comes from Malolactic fermentation). Again, this wine is unwooded however has some complexity and a nice mouthfeel. Again, I suspect this wine has seen some lees aging to achieve this. Vasarelli’s suggest their Pollo della casa (chicken breast with mushrooms & spring onions all in a creamy masala sauce). Unusually for Sauvignon Blanc this wine was also aromatically challenged, but on the palate showed reserved hints of passionfruit, cut grass with a good acid length. I do not enjoy the overtly aromatic and in your face style Sauvignon Blancs – of which this wine is not one of those! While drinking this, bring me a big plate of mussels cooked in wine and tomato sauce (with more than a hint of chilli) and along side this would be a pile of cut fresh crusty bread to soak up the juices. When I warmed this wine up (hand around the glass) it showed some straw characters. The palate continued with the delicate flavours of grass, tomato bush and passionfruit. There is a long finish on this wine as it has plenty of acid. Vasarelli’s suggest their Spagetti al Scoglio (seafood selection tossed with garlic, tomato into a mound of spaghetti). I was keen to try the first red offering as Cabernet Franc is not what I would consider a main steam varietal. The nose was light on the fruit but showed some wood characters – smoky and sandalwood tones. The palate had hints of plum and nutmeg, with soft tannins and soft wood characters. It was interesting that the oak seemed to provide a very pleasant overall lift. Vasarelli’s recommend this wine with Pene e Pesto fatte di casa (Penne pasta with basil pesto, panchetta with toased cashew and pine nuts). Currency Creek is a small wine producing region in the Southern Fleurieu Peninsula near Goolwa and is heavily influenced by the weather conditions from both the Southern Ocean and Lake Alexandrina. The wine aromas were influenced by dark plums and vanilla from the oak treatments. The palate is absolutely chock full of sweet fruit – the wine is not sweet however the fruit sweetness is paramount here. Blackberries, stewed plums up front and pepper combined with fine tannins on the back palate. This wine is a good everyday lighter, easy drinking style red – very suited to finger foods or pizza. Not normally a variety I drink, but I noted with great interest that the Vasarelli Merlot has won a number of awards over the last few years (award certificates are displayed on the walls around the tasting bench. On this basis, plus a recommendation from the cellar door staff, I was looking forward to trying this wine. The nose was a little closed – there was some fruit coming through but I could not tell what fruit. The palate showed the sweet fruit (as with the Shiraz above) based on plums and blackberries. The up front fruit was quite juicy but it finished a little short and was not lingering on the back palate. Vasarelli’s recommend Salsiccia di Pasquale (grilled sausages on a bed of grilled capsicums, egg plant, onions and tomatoes). I am continually surprised by the quality of Cabernet from McLaren Vale – you think I would learn by now! this one kept up this wonderful trend. I was finding that Vasarelli red wines are very fruit driven – again the sweet fruit comes through in waves. ll the typical cassis characters mixed with good dry dusty tannins to produce another good drop. Vasarelli’s recommend their ravioli with tomato based sauce. A wonderful nose infusion of spice, plums (fresh) and black fruits – easily the best aroma from the red wines so far. The fruit continues onto the palate with lots of the spice and wood characters – all melded into a wonderfully balanced infusion. This wine went home with me to be consumed while eating a nice steak dinner. A blend of Cabernet Sauvignon (~65%), Cabernet Franc (~25%) and Merlot (~10%) and is only available for a limited time as there are only a small number of bottles left. The nose was vegetative – green capsicum, with cassis and mocha. The sweet fruit characteristics are here again, with blackberries, soft tannins, unobtrusive oak with a long dry finish. Vasarelli’s suggest consumption with their Porterhouse steak with oven roasted potatoes. A blend of Cabernet Sauvignon, Shiraz, Malbec and Grenache (proportions unknown). The colour was just showing some browning. The nose was dominated by mocha and vegetative characters – not fruit based. The palate again showed sweet fruit with hints of mocha. I note that the Grenache characters come through with the fruit (red berries). The wood is mellow and the finish is dominated with dry dusty tannins. Vasarelli’s suggest Lamb Cutlets served with grilled sweet potato, zuccini, eggplant and red wine glaze. This entry was posted in Mclaren Vale, wine and tagged Cabernet, cellar door, Chardonnay, Mclaren Vale, McLaren Vale Wine, Shiraz, Small Producer, wine, wine McLaren Vale. Bookmark the permalink. I assume you are looking for the opening times for the Lonely Grape. If this assumption is correct then I must tell you that I do not have a physical shop. I do sell wine through my web site http://www.tastemclarenvale.com.au where I have six packs of artisan wines from McLaren Vale. I hope this helps. New website to be launched Spring 2010.